Don't you just love the illustrations of Eric Carle in children's books? Did you ever wonder how to paint like Eric Carle? 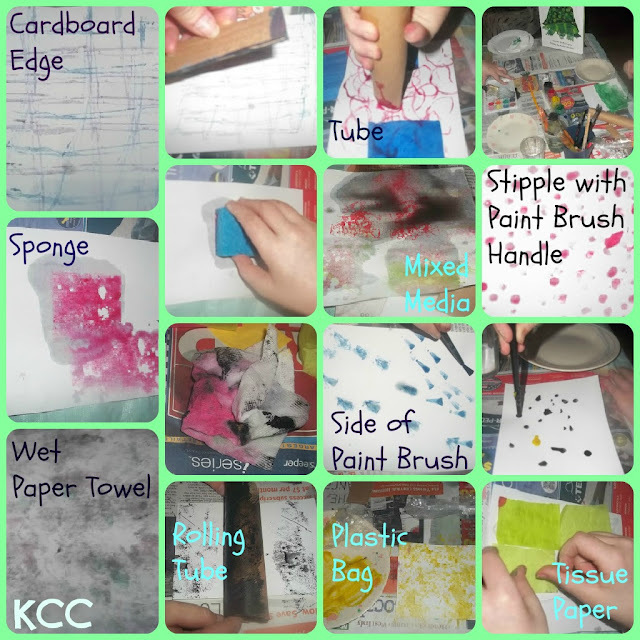 This Homeschool Art Project takes some time, but it is worth the effort. Enjoy! Use different household items to achieve varying patterns. I love how the piece of cardboard makes a herringbone pattern when crossed. The side of a paint brush looks like animal tracks. We even used the end of our paint brush to make stipple patterns. The dirty, wadded up paper towel made a glorious pink, green, and black impressionist style. and then cut his patterned papers to illustrate. and each child painted in each technique. We made 16 different patterns with our paint. 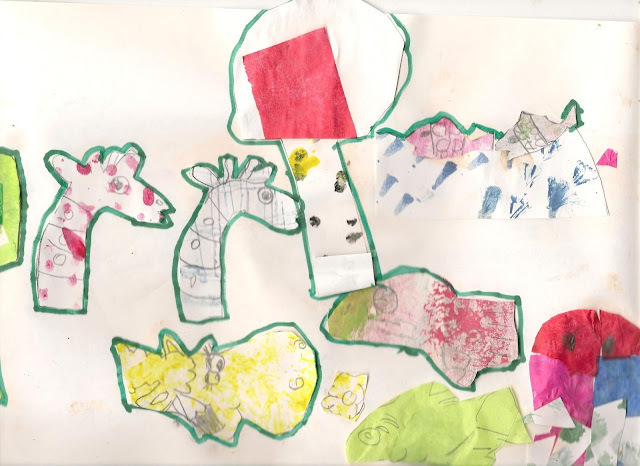 Eric Carle style illustration focusing on Giraffes. Jake doesn't like to draw so we cut images out of coloring books, traced them and filled them in with bits of our pattern painting projects. Mayhem used a coloring book image but chose to draw many of her own designs. These techniques also work fine motor skills. You will need watercolor or tempera paint, brushes, paper towels, salt, cardboard scraps, tissue paper, art paper, sponges, plastic bags, and imagination. 1. Salt Painting - paint with a color, sprinkle salt over it, allow to dry for a sparkly texture. 2. Stipple - use the end of a paintbrush to make dots. 3. 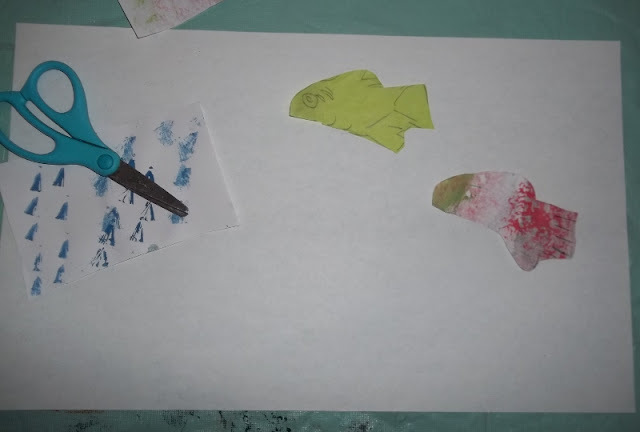 Animal Tracks - flatten the brush on the paper to make tracks. 4. Tissue Paper - wet and use it to paint or glue a collage of colors onto your sheet. 5. Toilet Tube - use like a roller or hold upright and stamp circles or hearts with the end. 6. Sponge - cut a sponge into small shapes and blot on paper. 7. 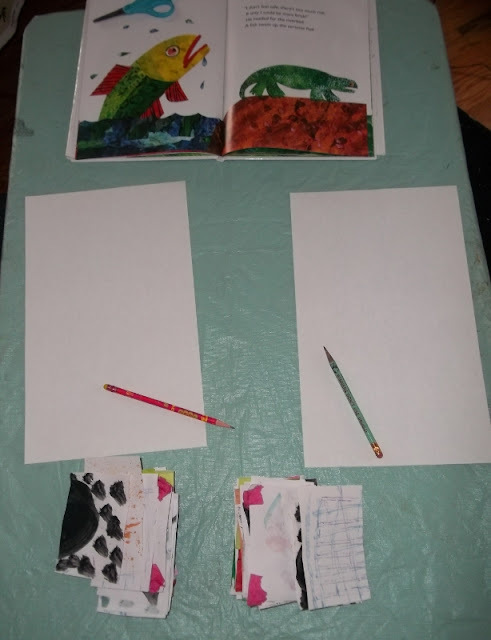 Paper Towel - use your dirty paper towel and blot on paper for a fun print. 8. Cardboard Edge - use the edge of the cardboard to make straight lines. 9. Plastic Bag - Tie a bread bag in a know or wear it like a glove and dab it paint. Let your paintings dry overnight (at least an hour). Draw or trace your favorite animals, lay out your design on paper, take your squares, and cut them up to fill in the pictures (think puzzle pieces). See the example above for ideas. 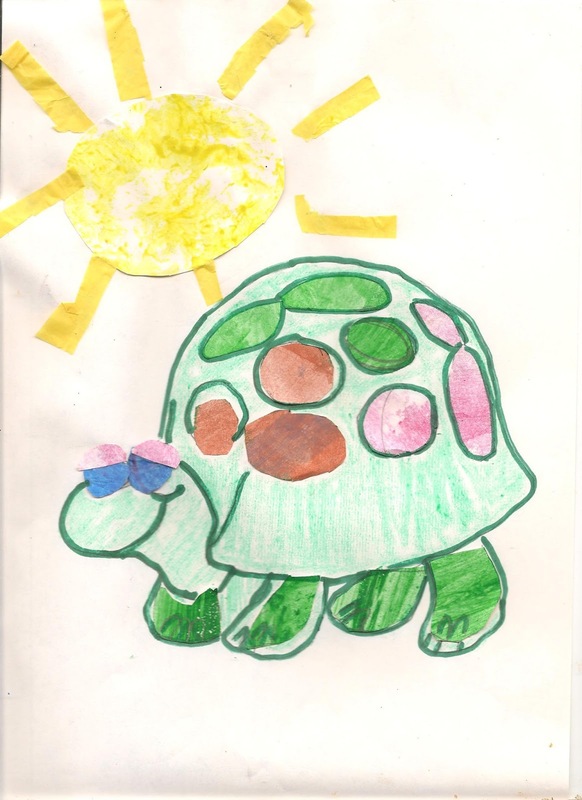 Jake complained about how horrible his turtle looked. Of course, I think it looks awesome. He enjoyed tracing the turtle. The idea of it looking perfect is very important to him. Flowing, organic art makes him crazy. As a gifted child, he needs and thrives on structure. Without structure, all chaos breaks loose. Perfectionism is an artist's worst enemy. Mayhem, on the other hand sits down and lets her art tell her where it wants to go. Great artist come in both styles. We're working on Jake's rigid issues in Jake's Journey in Art. We'd love for you to join us.